CouncilmanHenry Yanez was appointed yo the Sterling Heights City Council in January 2019. Prior to his appointment to City Council he represented the City of Sterling Heights in the state legislature as State Representative in the 25th House District. Henry worked hard to maintain and improve the quality of life for all residents, especially seniors and veterans. Furthermore, Henry understands the issues facing the hard working families of Sterling Heights and the fight to create and retain jobs for them. As a retired Sterling Heights firefighter/paramedic Henry understands the importance of a safe community. As a citizen, homeowner and taxpayer Henry knows how hard people work for their money and that government should prioritize the spending of our tax dollars. 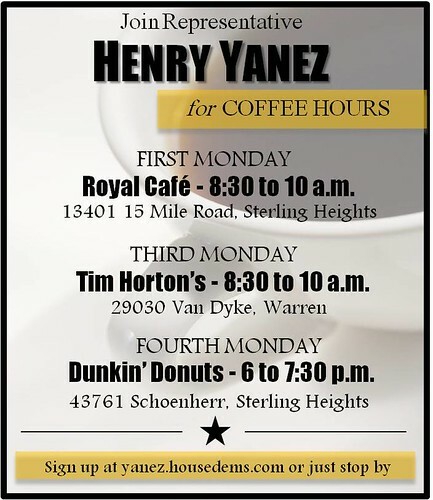 Councilman Henry Yanez knows about hard work. He has seen it all his life. Councilperson Yanez is the youngest of six children. His father was a 48-year employee of the Ford Motor Company and proud member of UAW Local 600. After graduating from Madison Heights High School in 1975, Rep. Yanez became a machine tool electrician and was a member of the UAW and IBEW. In 1985, Henry Yanez heard the call to help and became a member of the Troy volunteer fire department. In 1991, he answered the call again and became an emergency medical technician, taking classes at Macomb Community College. He continued at Oakland Community College, earning his Associates Degrees in Fire Science and General Studies. Then, in 1995 Rep. Yanez became a firefighter and paramedic for the City of Sterling Heights where he resides. In addition, Henry was a proud member of the International Association of Firefighters Local 1557, and served as a delegate to the Democratic National Convention in 2004 and 2008. He has also volunteered for many organizations over the years including youth, senior, social and environmental causes. Henry Yanez is a family man who understands. Rep. Yanez is married to wife, Jane, and has four children: His son Ryan (and his fiancee Lynae), daughter Alison (and her husband Ryan – or Ryan #2, as he’s affectionately known in the family); and stepdaughters Natalie and Cassidy. Rep. Yanez is also now a proud grandfather to 1-year-old Kellen! I’m Henry Yanez, and I’m YOUR City Councilman. Thank you for visiting my website. I’m truly honored to represent you and our community in Lansing. As your state representative, I’m here to fight for what’s important to you and your family. This is our first step in a long march – a march that will take us through the neighborhoods of Warren and Sterling Heights. Along this journey I hope to hear from the citizens of these two great communities about what they want and expect from their government. I look forward to having all of you join with me in our efforts to keep Warren and Sterling Heights the great communities they are – great places to live, work, and raise a family. Please contact me if I can help you resolve any problems related to state government.